ikepela is redambition: Yes, me. Camping. It would appear that I have a reputation as a high maintenance girl. A high maintenance girl who likes the good things in life. While that's not a false statement in the least - I do like the good things in life. Amongst those things is spending time with good friends, having a good time. It was at the suggestion of one such friend that I decided to brave camping again. The last time I went camping I was eleven-ish, with a scout group. I ended up in hospital because the camp leaders thought I had measles, when in fact I was just being devoured alive by mosquitoes. It seems that I'm a walking cocktail for the blighters, missing only a fetching paper umbrella if I'm not carrying my parasol, but I digress. As you can see, this past experience left me a little apprehensive about camping and other outdoorsy activities. if anyone is now hoping for more camping horror stories and amusing anecdotes about how I'm never going to do that again, I'm sorry to disappoint you. I loved it. I still have amusing stories though. On the Saturday of the long weekend I woke up at an ungodly hour (I believe it's called stupid o'clock), packed the car up and started to drive down to Wee Jasper. I was lucky enough to drive through Yass, and thus see the famous Maccas sign. From Yass you then take the one (!!) road that winds it's way down to Wee Jasper village. I would love to post pictures of the drive as there were some beautiful sights, however as I was only one in the car I felt staying on the road was a higher priority. Arriving in one piece and all that. Arriving at Wee Jasper meant one thing: a break from technology. There is no phone reception there, which means no checking the phone, no 3G, no Twitter, no internet, no SMS. Nothing. Bliss. After setting up camp (and helping a friend put up her Taj Mahal of a tent, I swear it would have fit in at the Quidditch World Cup), a couple of the girls and I headed into the village to check out the general store and make some calls on the public phone (just to let people know we'd arrived safely etc). While up there, I spotted some flowers and took a few shots. We also spotted a marquee on a nearby property. It looked like a wedding being set up. That done, a night of relaxing around the campfire was in order. 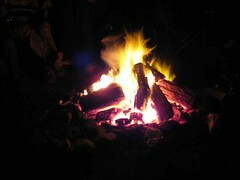 Wee Jasper is one of the few places where you can still have a campfire, so burn baby, burn. I had also brought along some glow sticks (for safety, I promise you!)  Give a kid a couple of glowsticks on string, and you'll keep them amused for hours! And so to bed. I was looking forward to enjoying a good night's sleep. Maybe. I was thinking that I might have to deal with the odd wombat wombling past, or perhaps a koala or something. I didn't expect Daft Punk. Yes, Daft Punk. That marquee I mentioned earlier? Not a wedding. Someone was holding a rave/dance party thing on their property... and the music was echoing into the valley where we were camped. Nature, isn't it fab? The music continued through the night until 9am the next morning. Well done kiddies, you went hard! It was actually quite funny - I'd wake up through the night, not because of the music but because I was in unusual surroundings, and each time I'd think either "Oh, that's a great track" or "I HATE THIS SONG MAKEITSTOP!" before falling asleep again. Sunday saw us at the Wee Jasper markets, were I ate my bodyweight in (well, half a dozen) dutch donuts. 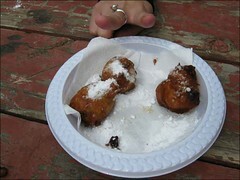 These things were amazing - like a piece of deep fried raisin toast. I might have to try and crack the recipe for them! 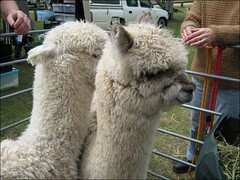 Another thing of note at the markets were some alpacas! They were babies, just seven months old. Their coats were so unbelievably soft. I was devastated to hear that their soft fluffy coats were to be discarded after they were shorn - but they were so dirty and full of grassy bits that it's just not feasible to try and spin them up. Back at camp, I amazed myself at remembering how to cast a fishing line. We were camped right near a river (no pics, I was too busy skipping stones), so some of the kids got a chance to try and catch some trout. 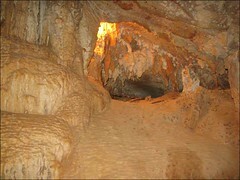 Candle smoke is actually quite bad for the cave (as is the mere presence of humans) so most other cave sites just won't allow it. 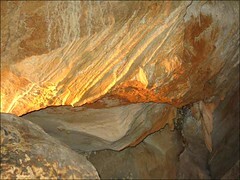 It was amazing to see how the cave would have looked to those who first explored it. 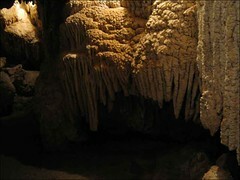 The cave is a set of large chambers, so it's easy to navigate and has some really beautiful features. We were also lucky enough to see it after some recent rain - so there was water around! The cave tired us all out, but of course next on the agenda was the NRL Grand Final. I have to say, watching this at our (unpowered) camp site was an experience. We had a McGyvered solution: Satellite dish -> TV running off a Land Rover Defender. It was most amusing and it attracted quite a crowd. Good times, and an amazing piece of work by one of the guys! It was quite a shame to come back to reality on Monday. Anyone up for a camping trip? Dutch donuts are also known as Olle Bollen. 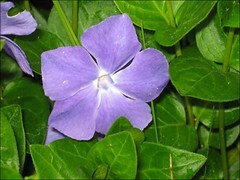 Are VERY tasty, and supposed to bring good luck for the year if you have them on Jan 1st. May have to do a batch this coming Jan 1st. they're oliebollen... my oma used to make them for us. you can get pre-mix by koopmans (easier, fun to try and navigate the dutch instuctions) at t'winkletje (the little shop/holland house) in... whetherill park, I think.